Liwonde Game Park, Malawi … The Land Rover inched to within a few dozen feet of the tall tree, then stopped. The driver began to quietly explain what we were viewing in front of our vehicle, and just above our heads. A baboon darted across in front of the silent vehicle, and scurried up a nearby tree, to gain a better view of his visitors. The guide pointed to the tree and especially made note of the large objects handing down from the tree limbs. They looked exactly like giant breakfast sausage. In fact, Oscar Meyer would obviously have been envious had he seen them! Not to say they are the same as our breakfast sausages; on the contrary, the ones hanging from the tree in front of us can weigh as much as 10 kg (over 20 lbs), and could easily cause a skull fracture if they fell on a person’s head. No wonder the driver stopped well short of being directly under this hanging fruit. The baboon cocked his head, then scurried down the other side of the tree and ran off into the forest. The fruit of this tree serves as an excellent food source for baboons, bush hogs, elephants, giraffes, hippo, monkeys, and porcupines. Parrots eat the seeds, and the elephant and kudu consume the foliage. For humans, the sausage tree offers a well-stocked pharmacy. Like many other plants leaves, and fruit in the sub-Sahara, this one offers significant medicinal value. It can be used to treat fungal infections, boils, psoriasis, and eczema, as well as leprosy, syphilis and skin cancer. It can be used in the treatment of dysentery, ringworm, tapeworm, postpartum hemorrhaging, malaria, diabetes, pneumonia, and even toothache. The Tonga tribes on the Zambezi use its ingredients as a face cream to give a blemish-free complexion. 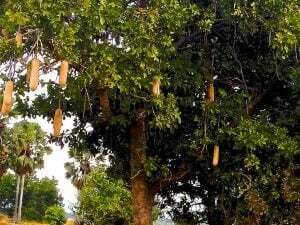 In 2007 a sausage tree in Okavango Delta, Botswana was serving as an airport departure lounge.